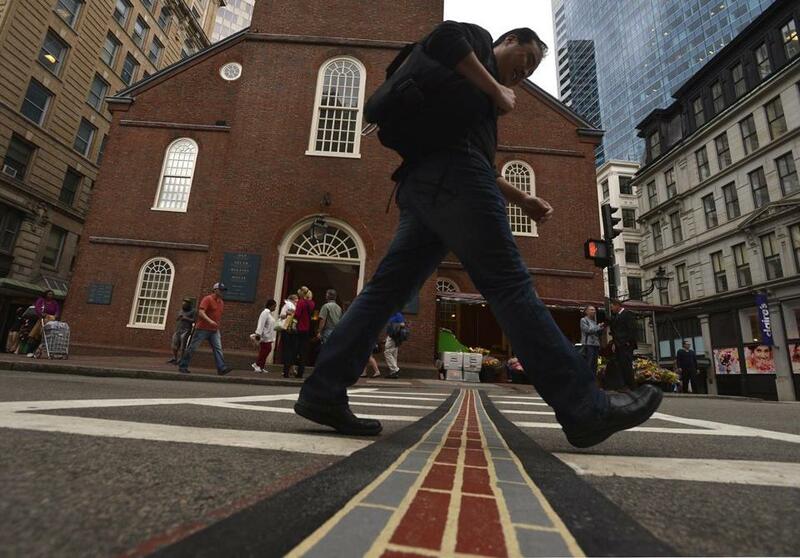 The historic Freedom Trail in Downtown Crossing. Greater Boston, already one of the most walkable metropolitan areas in America, is only getting more so, according to a new study. The region ranks third in a recent analysis of walkable American metros, trailing only greater Washington, D.C., and New York, according to a report by the urban planning group Smart Growth America. But the Boston area is poised to jump even higher in the rankings in the coming years, thanks to an increasing emphasis on commercial development in walking-friendly areas. The study projects that Boston will become the most walkable metropolitan area in the country. Metro Boston’s demand for office space in walkable neighborhoods is increasing at rates far surpassing other regions, the study found. Rents in walkable neighborhoods are rising faster in the Boston area than in any other city in the country, as residents and workers here seek the coffee shops, cafes, and boutiques of urban life. While most of the walkable areas in New York City are confined to the island of Manhattan, the Boston area has embraced widespread urban development. Of the Boston area’s 37 walkable commercial districts, six of them are located in the adjacent communities of Cambridge, Somerville, and Brookline, while older cities such as Newburyport, Fitchburg, and Plymouth have also steered economic and residential development to their downtowns. Walkable urban places offer a mix of commercial and residential real estate, multiple transportation options, and close proximity of schools, stores, and restaurants. In addition to offering an array of amenities, walkable neighborhoods tend to generate more economic activity, with higher per capita gross domestic products, according to the report. Regions with high walkability ratings had larger percentages of residents with college degrees, Smart Growth America found. By moving away from a car culture, cities and towns can also decrease their obesity, asthma, and social isolation rates, said Julie Willems Van Dijk, deputy director of the County Health Rankings and Roadmaps Program at the University of Wisconsin’s Population Health Institute. A study by the American Planning Association found that 74 percent of Gen Y respondents believed that investing in transportation choices and walkable areas was a better way to grow the economy than traditional approaches. An emphasis on urban workplaces is even greater among those working in the technology sector. Earlier this month, the Globe reported that Boston and Cambridge accounted for 63 percent of job openings for software engineers in 2013, compared to 13 percent in Burlington, Lexington, and Waltham. The Massachusetts Secretary of Economic Development found that companies in suburban locations dominated by car commuters now pay $25,000 more per year for software engineers than their peers in walkable Boston and Cambridge. Even consumer brands are embracing the trend. The iconic sneaker maker Converse Inc. is moving its office from suburban North Andover to the waterfront near Boston’s North Station. “That’s really all about attracting young employees who want to be working in a place where they can walk out their door and get to work in ways other than a car,” Landman said. See a map of the 37 walkable urban places in Greater Boston.